I have not been a fan of high IBU beers. 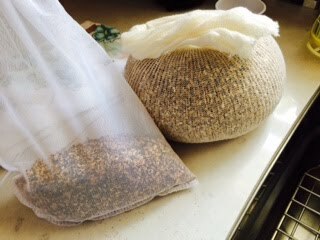 I like malt characteristics of English-style beers, so I found an English Pale Ale (EPA) recipes with Maris Otter, Crystal Malt, and Special B. Instead of Kent Goldings switch it with Citra. I know Citra is not an EPA hop, but it was my experiment to see how much the flavor changed. 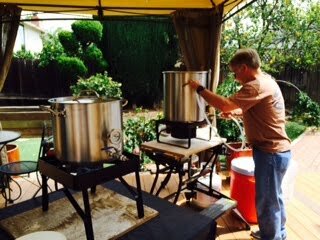 I used the same hop weights as the recipe, so I had a one to one comparison. If there weren't a lot of Citra characteristics then I'd still have a drinkable beer. If there were a lot more flavor, then I'd know how much the oil differences between Citra and Kent Goldings affect the flavor. My recipe was for 3 gallons. From the start I wanted to make smaller batches so I could experiment more. I don't drink everyday and I don't want a bunch of beer lying around. What beer I do brew has encouraged more hottub parties at my house, so maybe not a bad thing for my friends. that beer was forever named a Wheat EPA. We had to take a trip for more propane with my friend's burner which allowed my steeping to fall to 140°F before warming it back up to 155. There were a few mishaps. I forgot my clarifier and I put i n the chiller late which made me run the boil a bit longer. Probably hurting my hop flavoring a bit, but only a few minutes extra. 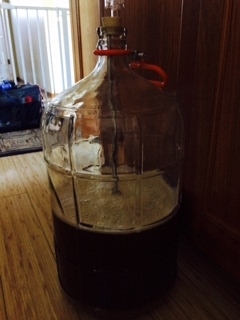 Nevertheless, I hit the target gravity and was ready to ferment. The 3 gallons looked a bit funny in the 6 gallon carboy. Luckily the thermowell that had finally came in stock at MoreBeer. 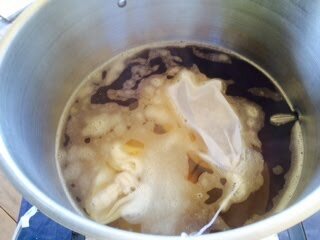 Also luckily it was long enough to reach the wort. Even before I got home I felt it was going to be too light of hop flavor. I modified the recipe and planned to brew another batch when the fermentation fridge was empty. I named this beer C1, and the following on recipe C2. The end result was only a hint of Citra. It was a drinkable beer, just not a lot to distinguish it.